This hygrometer has been developed to take quicker measurements of humidity and temperature. 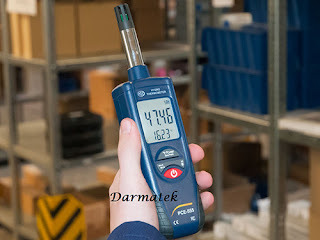 The PCE-555 hygrometer also offers a calculation of dew point and information about wet bulb globe temperature. This allows for the elimination of fungus in food storage, as well as in food transportation. It is also very useful in the construction industry for determine condensation in walls. This hygrometer is ideal for taking measurements in situ, so long as the humidity sensor is not touched, not manipulated or not placed directly into liquid as it is a very sensitive component.